Discover how Smartsheet can help maximize your finance operations efforts. 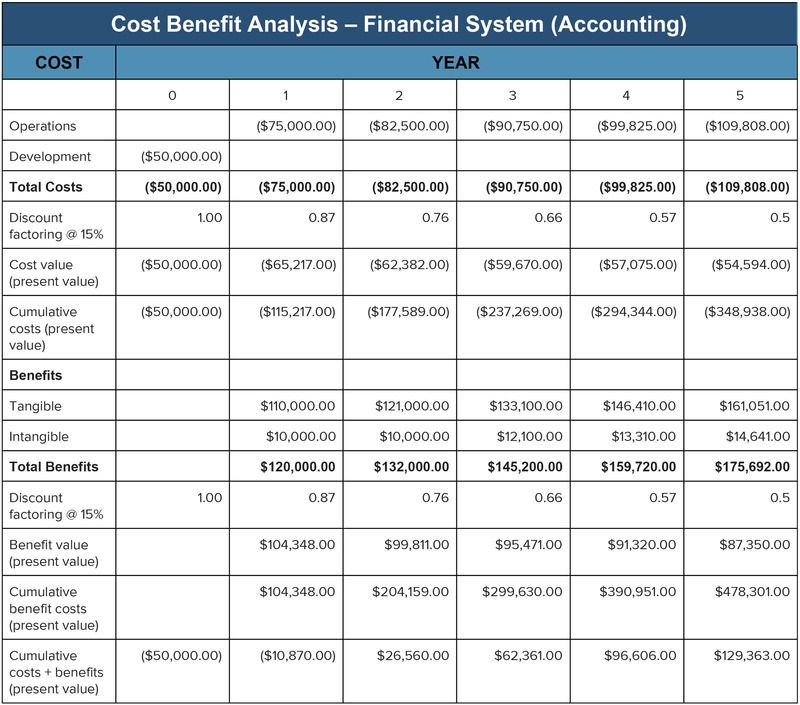 Cost benefit analysis: What is it? A cost benefit analysis (also known as a benefit cost analysis) is a process by which organizations can analyze decisions, systems or projects, or determine a value for intangibles. The model is built by identifying the benefits of an action as well as the associated costs, and subtracting the costs from benefits. When completed, a cost benefit analysis will yield concrete results that can be used to develop reasonable conclusions around the feasibility and/or advisability of a decision or situation. Why Use Cost Benefit Analysis? Organizations rely on cost benefit analysis to support decision making because it provides an agnostic, evidence-based view of the issue being evaluated—without the influences of opinion, politics, or bias. By providing an unclouded view of the consequences of a decision, cost benefit analysis is an invaluable tool in developing business strategy, evaluating a new hire, or making resource allocation or purchase decisions. The earliest evidence of the use of cost benefit analysis in business is associated with a French engineer, Jules Dupuit, who was also a self-taught economist. In the mid-19th century, Dupuit used basic concepts of what later became known as cost benefit analysis in determining tolls for a bridge project on which he was working. Dupuit outlined the principles of his evaluation process in an article written in 1848, and the process was further refined and popularized in the late 1800s by British economist Alfred Marshall, author of the landmark text, Principles of Economics (1890). Once your program or policy change is clearly outlined, you’ll need to build out a situational overview to examine the existing state of affairs including background, current performance, any opportunities it has brought to the table, and its projected performance in the future. Also make sure to factor in an objective look at any risks involved in maintaining the status quo moving forward. Now decide on how you will approach cost benefits. 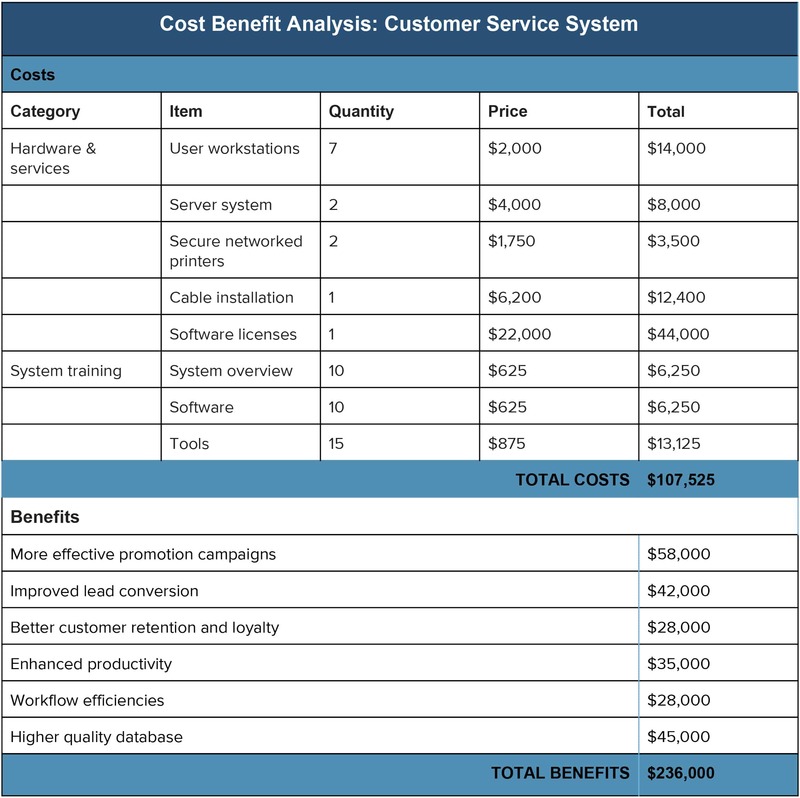 Which cost benefits should be included in your analysis? Include the basics, but also do a bit of thinking outside the box to come up with any unforeseen costs that could impact the initiative in both the short and long term. In some cases geography could play a role in determining feasibility of a project or initiative. If geographically dispersed stakeholders or groups will be affected by the decision being analyzed, make sure to build that into the framework upfront, to avoid surprises down the road. Conversely, if the scope of the project or initiative may scale beyond the intended geographic parameters, that should be taken into consideration as well. Now that you’ve developed the categories into which you’ll sort your costs and benefits, it’s time to start crunching numbers. With the framework and categories in place, you can start outlining overall costs and benefits. As mentioned earlier, it’s important to take both the short and long term into consideration, so ensure that you make your projections based on the life of the program or initiative, and look at how both costs and benefits will evolve over time. TIP: People often make the mistake of monetizing incorrectly when projecting costs and benefits, and therefore end up with flawed results. When factoring in future costs and benefits, always be sure to adjust the figures and convert them into present value. Here we’ll determine net present values by subtracting costs from benefits, and project the timeframe required for benefits to repay costs, also known as return on investment (ROI). The process doesn’t end there. In certain situations, it’s important to address any serious concerns that could impact feasibility from a legal or social justice standpoint. In cases like these, it can be helpful to incorporate a “with/without” comparison to identify areas of potential concern. The impact of an initiative can be brought into sharp focus through a basic “with/without” comparison. In other words, this is where we look at what the impact would be—on organizations, stakeholders, or users—both with, and without, this initiative. TIP: Never confuse with/without with a before-and-after comparison. In the home stretch of the cost benefit analysis, you’ll be looking at the results of your work and forming the basis to make your decision. When evaluating your findings, it’s important to take discount rates into consideration when determining project feasibility. Positive - If both increasing and decreasing the rate yields a positive result, the policy or initiative is financially viable. Negative - If both increasing and decreasing the rate yields a negative result, revisit your calculations based upon adjusting to a zero-balance point, and evaluate using the new findings. Based upon these results, you will now be able to make a clear recommendation, grounded in realistic data projections. Despite its usefulness, cost benefit analysis has several associated risks and uncertainties that are important to note. These risks and uncertainties can result from human agendas, inaccuracies around data utilized, and the use of heuristics to reach conclusions. Much of the risk involved with cost benefit analysis can be correlated to the human elements involved. Stakeholders or interested parties may try to influence results by over- or understating costs. In some cases, supporters of a project may insert a personal or organizational bias into the analysis. On the data side, there can be a tendency to rely too much on data compiled from previous projects. This may inadvertently yield results that don’t directly apply to the situation being considered. Since data leveraged from an earlier analysis may not directly apply to the circumstances at hand, this may yield results that are not consistent with the requirements of the situation being considered. Using heuristics to assess the dollar value of intangibles may provide quick, “ballpark-type” information, but it can also result in errors that produce an inaccurate picture of costs that can invalidate findings. In addressing risk, it’s sometimes helpful to utilize probability theory to identify and examine key patterns that can influence the outcome. Accuracy affects value – Inaccurate cost and benefit information can diminish findings around value. Don’t rely on intuition – Always research benefits and costs thoroughly to gather concrete data—regardless of your level of expertise with the subject at hand. Cash is unpredictable – Revenue and cash flow are moving targets, experiencing peaks and valleys, and translating them into meaningful data for analysis can be challenging. Income influences decisions – Income level can drive a customer’s ability or willingness to make purchases. Money isn’t everything – Some benefits cannot be directly reflected in dollar amounts. Value is subjective – The value of intangibles can always be subject to interpretation. Don’t automatically double up – When measuring a project in multiple ways, be mindful that doubling benefits or costs can results in inconsistent results. When thinking about the most controversial aspects of cost benefit analysis, all paths seem to lead to intangibles. Concepts and things that are difficult to quantify, such as human life, brand equity, the environment, and customer loyalty can be difficult to map directly to costs or value. With respect to intangibles, Dr. Kaplan suggests that using the cost benefit analysis process to drive more critical thinking around all aspects of value—perceived and concrete—can be beneficial outcomes. “[Cost benefit analysis] assumes that a monetary value can be placed on all the costs and benefits of a program, including tangible and intangible returns. ...As such, a major advantage of cost-benefit analysis lies in forcing people to explicitly and systematically consider the various factors which should influence strategic choice,” he says. Originally built for the 1962 World’s Fair, the Seattle monorail runs between the Seattle Center and the city’s downtown area. Several times over the past 50+ years, the city has considered extending monorail service to key areas in order to provide more transport options for residents. 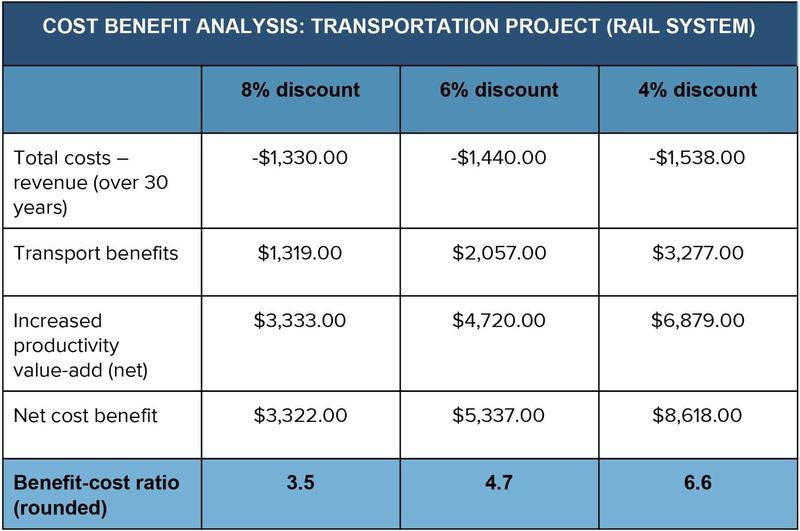 The following is an excerpt from a cost benefit analysis performed by DJM Consulting and ECONorthwest on behalf of the Elevated Transportation Company to assess an expansion project. The estimated costs for constructing and operating the monorail are $1.68 billion (in 2002 dollars). This includes a total capital cost of $1.26 billion and a total discounted stream of operating costs of $420 million (at approximately $29 million a year), using the same discount rate (7.95%). Operating costs were discounted over a span of 22 years, from 2008 through 2029. Benefits accrue for 23 years from 2007 through 2029. A discount rate of 7.95% was used to estimate the total benefits, in 2002 dollars. The net benefits were evaluated to be $2,067,263,000. A team of outside engineers and contractors determined that there is a 60% chance the monorail project would come in at or under budget and a 90% chance the project will come in under 1.15 times the budget. The travel demand forecasters included a 10% range around their estimate of future monorail ridership. For the case where the costs are low and the benefits are high, a 9.9% return is expected. For the case where the costs are higher than expected and the benefits are lower, a 5.2% return is expected. California's Department of Resources Recycling and Recovery’s mission is to help state residents achieve the highest waste reduction, recycling and reuse goals in the U.S. The following is an excerpt from a cost benefit analysis performed in 1997 to compare the costs of Cardiovascular Group’s (CVG) solid waste reduction program to its economic benefits. From these data, it is clear that CVG has benefited economically from its solid waste reduction programs. Average annual costs amounted to $16,440 per year, while benefits equaled $1,308,865 per year. Therefore, net savings from CVG’s solid waste reduction program amounted to $1,292,425 per year. Businesses of all sizes must manage their finances by assessing the costs of their processes against the expected benefits of the action through a detailed cost benefit analysis. However, in order to accurately gauge finances and track business spend, you need a real-time tool that offers visibility into project details to ensure that you are only spending money on the most essential business decisions. Use Smartsheet to boost visibility into your finance operations. Make real-time updates and share details with stakeholders to increase transparency and accountability. Self-service reports and dashboards in Smartsheet ensure that everyone is working with the most up-to-date information, so that no detail is missed and you are able to make decisions at the right time.